The first grade vocabulary words here are extremely important. First, these are the words that MANY first grade teachers use. But only if you are a patient person. Come on! Always remember that learning should be fun - or at the minimum, pleasant! Your Child Should Know These Words Instantly! By that, I mean your child should recognize the words immediately - upon sight - and read them. This is NOT a spelling list. This is a sight word list. 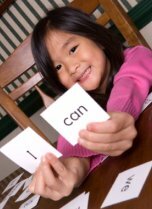 Sight words are to be taught as whole words, so do not break them down. Read each as a whole word. Take your time. There is no hurry. First grade lasts a whole school year. Keep reading, and you’ll soon discover exactly why it's important to start at the top of this first grade vocabulary list. Give the child a few words at a time. For example, one line at a time will be fine. It may take one, two, or three weeks for the child to learn a FEW words. It depends on many factors ... So make this a game, or please, do not teach. Practice for a VERY short period of time … Say five minutes. PLEASE do not frustrate your child! My suggestion for the first grade vocabulary is to make flashcards. At some point you should have his or her eyes checked by a professional. And I say, the sooner, the better. Here's an Amazing Fact for You! Dr. Edward B. Fry arranged his list of the most common sight words in order of frequency of use. His research determined that the first twenty-four words – found at the top of the list - make up about one-third of all published work! So, I say this is a VERY IMPORTANT first grade vocabulary list! I'm sure you'll agree. Now, here's more help for you and your child ... After viewing the following video several times, your child will soon have the rhythm of the song and know how to read the 24 most commonly printed words in the English-speaking world! Dr. Fry also discovered that the one hundred words listed here are commonly used in about half of ALL written publications! He encouraged children to memorize these sight words to become better readers. That's why if you want to help your child become a better reader, you're going to LOVE his lists. Important Note: If your child is struggling to learn the first one-hundred sight words, do not begin this list! Learn the first one hundred. Important Note: If your child is struggling to learn the second hundred sight words, do not begin this list! Learn the second hundred.